Order in the next 3 hours, 20 minutes an 49 seconds for same day shipping. This rubber stamp has been ergonomically designed to be able to be used with the minimum of fuss. 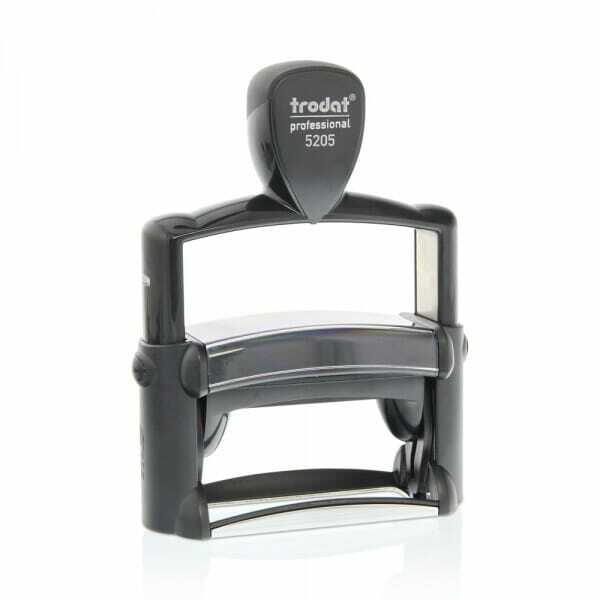 An elegantly designed self-inking stamp, the Professional 5205 is extremely reliable due to its robust metal framework. The Professional range of stamps is ideal for daily office use, guaranteeing precise and clean impressions. Stamps can be customised online using the design wizard. Logos, images and up to 6 lines of text can be added effortlessly, created in an impression that measures 70 x 25 mm . Professional text stamps include a black ink pad as standard, however, this can be swapped for any of the following colours: blue, green, red, or violet by purchasing a 6/55 replacement ink pad. Dry felt pads are suitable for special inks. Customer evaluation for "Trodat Professional 5205 70 x 25 mm - 6 lines"